Two musicians in Vietnam whose topical songs are popular among overseas Vietnamese were sentenced to prison Tuesday, prompting criticism from the United States and international rights groups. 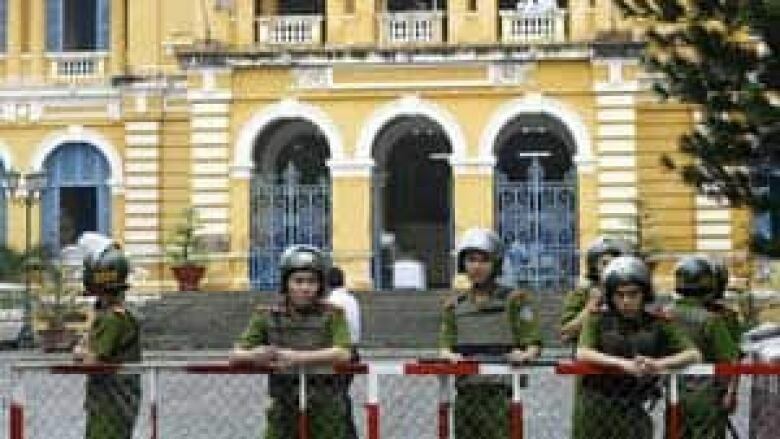 Vo Minh Tri and Tran Vu Anh Binh were sentenced to four and six years in prison, respectively, on charges of spreading propaganda against the state, said Tri's lawyer, Tran Vu Hai. They faced possible sentences of up to 20 years. In a half-day trial, a court in Ho Chi Minh City accused the musicians of posting songs on a website operated by an overseas Vietnamese opposition group, Patriotic Youth, according to Hai. Communist Vietnam does not tolerate challenges to its one-party rule. Tri, 34, known as Viet Khang, has composed songs criticizing the government for not taking a more aggressive position against China in the potentially resource-rich South China Sea, where Vietnam, China and other Asian nations have competing territorial claims. A video of his song Where is My Vietnam? (Viet Nam Toi Dau) has been viewed more than 700,000 times on YouTube. Binh, 37, is credited with writing the music for Courage in the Dark Prison (Nguc Toi Hien Ngang), a song that encourages nonviolent protest and expresses support for imprisoned blogger Nguyen Van Hai. The convictions come a month after Hai, known as Dieu Cay, and two other Vietnamese bloggers were sentenced to four to 12 years behind bars on the same charges. Human Rights Watch condemned Tuesday's trial and called for the songwriters' immediate release. "First critics, then bloggers, then poets, and now musicians!" Phil Robertson, deputy director at the New York-based group's Asia division, said in a statement. "The international community can no longer stand by quietly as these free speech activists are picked off one by one by Vietnam's security apparatus." Truc Ho, one of Tri's U.S.-based supporters, told The Associated Press in April that Patriotic Youth is a group of students, artists and young professionals who promote awareness of social justice and human rights issues in Vietnam. After Tri was arrested in December, Truc Ho said he and some friends launched a campaign in the United States to press for the songwriter's release. Their online petition to the White House gathered more than 150,000 signatures within a month, he said. The U.S. Embassy said it was deeply troubled by Tri's sentencing. "This conviction is the latest in a series of moves by Vietnamese authorities to restrict freedom of expression. The Vietnamese government should release this musician, all prisoners of conscience and adhere to its international obligations immediately," embassy spokesman Christopher Hodges said in a statement.